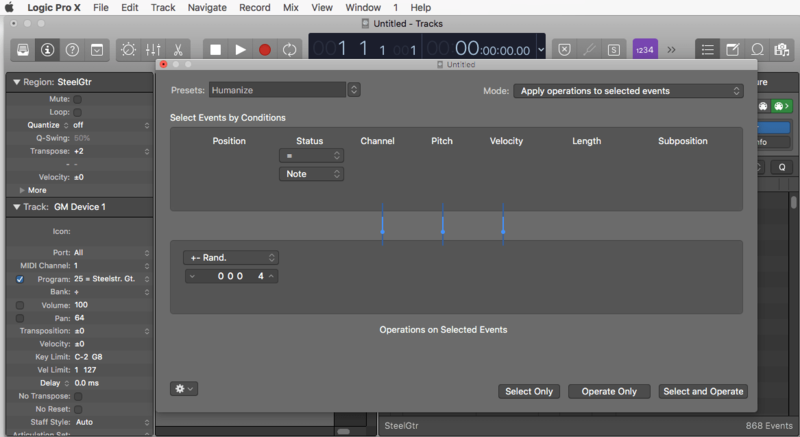 Logic Pro X by Apple MAC is a very powerful and easy to use MIDI File creator and editor. 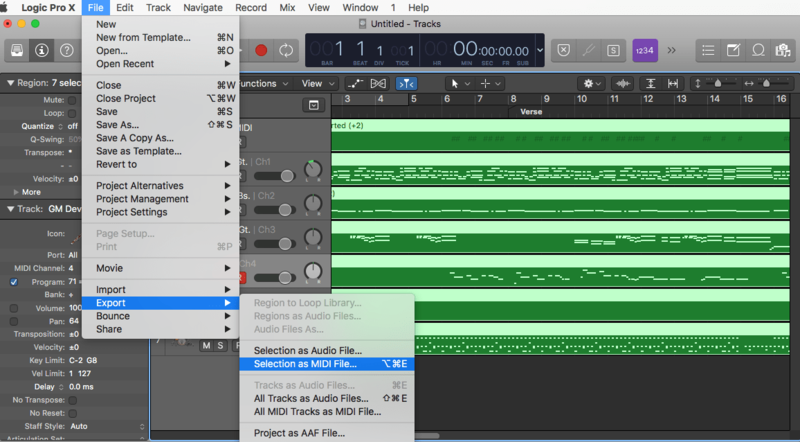 Make quick edits or record an album with relative ease using Logic Pro X. This feature rich DAW (Digital Audio Workstation) is industry standard. Any serious musician creating music should consider using Logic Pro X. Several producers at Hit Trax MIDI Files use Logic Pro X for its MIDI File friendly environment. In 1988, software makers Gerhard Lengeling and Chris Adam developed Creator Notator SL (Notator SL) on the ATARI ST computer. Notator SL used a series of parts called 'patterns' such as intro, verse, chorus etc, each with 16 MIDI channels or more using the optional MIDI expander. When patterns were complete, the music producer would link them in an 'Arrangement' and export as a Standard MIDI File. Around 1993 a new company 'Emagic' was formed and a Windows version named 'Notator Logic' was developed and for the first time included audio recording. In truth, the first Windows versions were terrible! Early PC RAM and memory limitations contributed to crashing and loss of song data as lamenting producers wished they never sold their old ATARI's. In 2002, Apple bought out Emagic and acquired Logic. In the same breath Apple announced it was discontinuing the Windows version making Logic exclusive to MAC. Despite rumblings among PC users this was seen as a good move which proved true. Apple put in a great deal of its resources to completely rebuild Logic from the ground up, a decision that resulted in Logic Pro X being the industry standard DAW and MIDI File creation platform. In this basic tutorial, I will show you how to load, edit, quantize, humanize save and convert MIDI Files in Logic Pro X. This tutorial does not cover creating a MIDI File from new although you can use this information and apply to a new project.. This tutorial assumes the user is using a professional MIDI File which is correctly setup to 'load and play' in a General MIDI device. Method #1 - Using Logic's EXS and other sampled Instruments. Go FILE>Open>Select MIDI File>Open: Logic scans each MIDI channel's embedded instrument program number and assigns compatible sounds. Method #2 - Using an external MIDI sound module. Go FILE>Open>Select MIDI File>HOLD COMMAND KEY>Open: Logic routes output to the external MIDI sound module. Select All then deselect the drum track (MIDI channel 10). On the left channel strip, adjust the amount of transpose. When done, Select All' and Normalize (Ctrl+N) to lock in the changes. Quantized tracks (where note position is quantized to the beat) van sound mechanical. This is okay in dance music and EDM. Rock and acoustic songs can sound static when quantized. Fortunately, it's easy to transform the song data like a human would play it. Set Velocity and Length windows to 'Thru'. Set 'Position' window to +- Random and set value to 0 0 0 4. Press 'Select Operate' to apply. The MIDI File will now have a more natural feel..
Advanced MIDI editing is possible though Logic Pro's MIDI Transform Window, where velocity, pitch, pitch-bends, humanize and precise note positioning are effected. 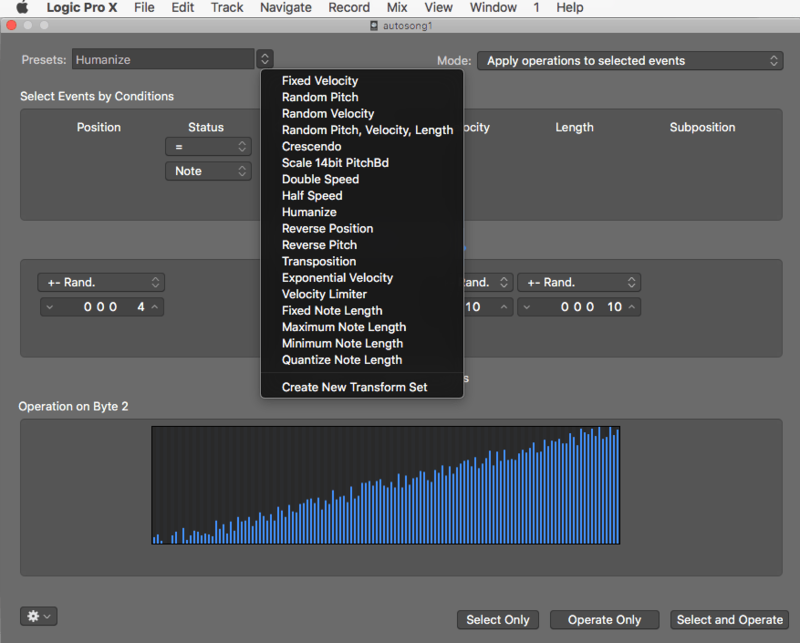 The MIDI Transform Window is one of Logic Pro X's most powerful features. The simple layout of the editing screen is self-explanatory making edits easy. All Transforms are reversible using standard undo command (Command+Z). Normalizing locks in any edits. Normalize can be undone if needed but you must Normalize after edits before saving the song file. Normalize is usually the last function before saving. 2: : Select All (COMMAND+A) then 'Export Selection s MIDI File. NOTE - this is a very important step. If you do not Select All, Logic will only export the highlighted section and ignore everything else. 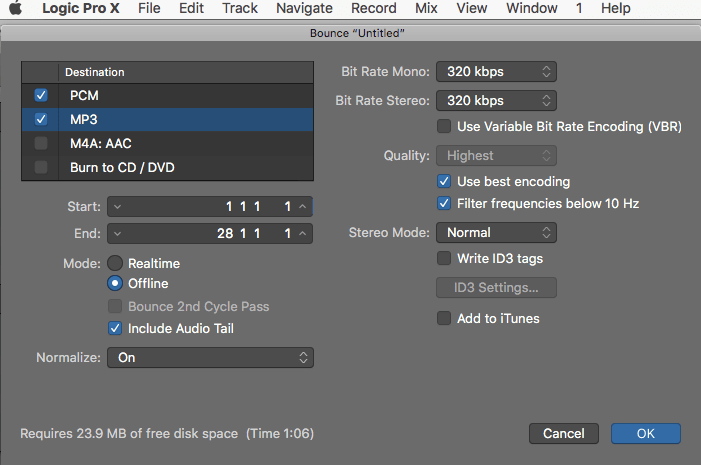 Logic Pro can create a stereo WAV MP3 and AAC audio file from track data. If you are using Logic's EXS samples and audio tracks (non-MIDI), the process is simple. Select All then go File>Bounce>Project or Section. This opens the window below. Select the formats you require hen press OK. If saving MP3, use the settings as shown in the image below (except Start/End which depends on song length). If your song tracks are MIDI, there's a little more involved. Refer to the YouTube video's in Related Links.